Stuffed Tomatoes – Take 4 tomatoes and remove the inside. 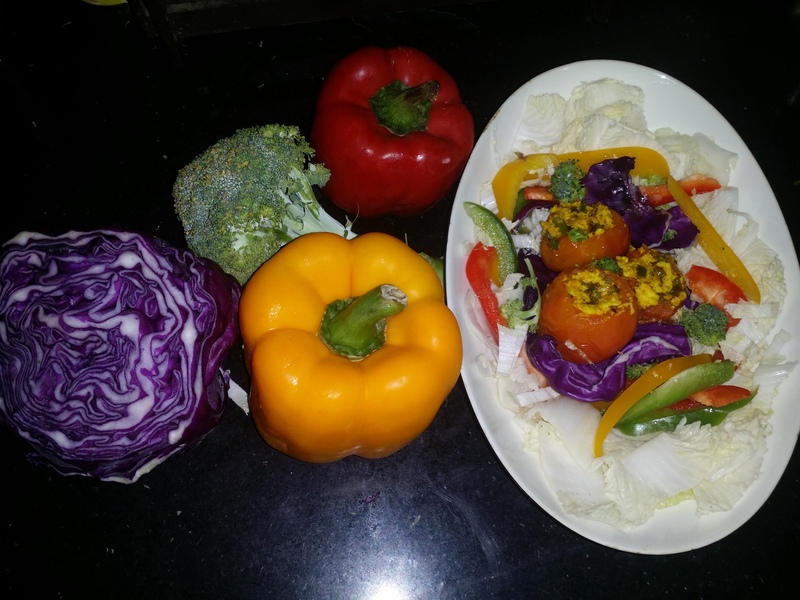 take a pan , put oil and finely chopped onion and 1/4th Green capsicum and turmeric powder. after 5 minutes add Grated Cottages cheese , sprinkle salt and black pepper to taste. Microwave for 1 minute. keep aside. ( put some salad leaves in the bowl in which you put the Tomato to microwave so that they doesn’t fall off on sides / the filling does not come out ). Salad – Cut all the Salad material in long pieces and toss it with olive oil, salt and black pepper. now place the microwaved stuffed tomatoes in the center and serve.